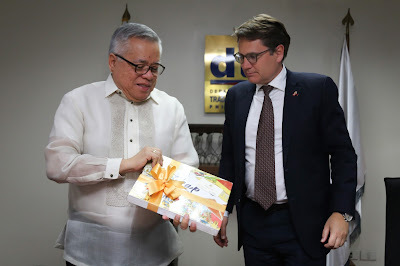 Department of Trade and Industry (DTI) Secretary Ramon M. Lopez met with his Danish counterpart, Minister for Industry, Business and Financial Affairs Brian Mikkelsen, to discuss trade and investment opportunities between the Philippines (PH) and Denmark (DK), especially concerning the PH government’s massive infrastructure program. “The current economic growth momentum, rating upgrades, and aggressive infrastructure programs offer a lot of business opportunities for foreign investors particularly with technology-oriented services and systems,” said Secretary Lopez. The trade chief also stressed that “President Rodrigo Duterte guarantees that your investments will be protected from corruption,” as he shared reforms to improve the ease of doing business and about the corporate tax scheme in the country. Minister Mikkelsen praised PH’s economic growth of 6.7% and said that they “want to be part of the development happening in PH.” He also expressed interest in bringing construction firms to participate in the PH’s “Build Build Build” infrastructure program. Apart from this, the European Union (EU) member state is also keen on investing in renewable energy and affordable medicine. Meanwhile, DTI is planning a Nordic culinary tour this year to promote Filipino cuisine to DK and its neighboring countries. DTI Undersecretary Nora K. Terrado said that they’re also planning a trade roadshow in DK in 2019 to promote Filipino trade and investments in general. PH currently enjoys GSP+ privileges with the EU and hopes to elevate this to a free trade agreement (FTA) soon. Also, discussions on the ASEAN-EU FTA are underway, with the last meeting held in Singapore last April 2018.